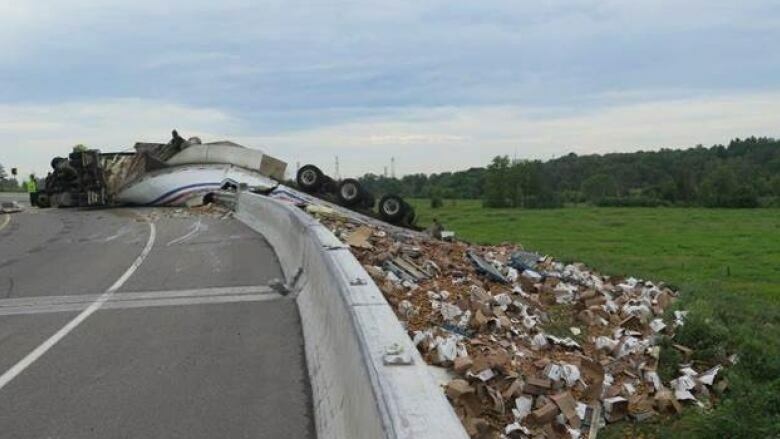 Hunt Club Road's westbound off ramp from Highway 417 is closed until further notice after a tractor-trailer flipped Friday morning dumping its load of potatoes. Firefighters were called to Hunt Club Road and Highway 417 at about 10:00 a.m. for a "serious" collision. A "large amount of debris and fluids" had spilled out of the truck, but the driver is safe, according to Ottawa Fire Services. On top of the spilled fuel, the field beside the highway was covered in potatoes that had flown from the truck. Firefighters said they immediately worked to absorb all the fuel to ensure it wouldn't ignite or spread further.